In this interview David Kornacki discusses the history of the Roycroft copper shop and its production of hammered copper items. Based in Manhattan, Kornacki can be reached through his website, Roycroft Copper, which is a member of our Hall of Fame. I started collecting Roycroft around 1992 when I visited the Peter Roberts Gallery in New York City. That was sort of the peak of the Arts and Crafts mania and there were many galleries in SoHo: Gallery 532, Peter Roberts Gallery, Michael Carey Gallery, and so on. I was amazed by the stuff I saw and thought that someday when I could buy real furniture I would love to get some. I remember being shocked at the sticker prices, I would turn over a Roycroft vase and it cost 1000 dollars. But a month or so later I went to a flea market and bought my first Arts and Crafts piece, a J. M. Young side chair, which I still own. At that point I realized you could get Arts and Crafts at reasonable prices if you go to flea markets and antique shows. My first piece of Roycroft was a month after that at the Triple Pier Antique show in New York City… a bowl that I still own. I started out pretty broadly with Arts and Crafts, before focusing in on Roycroft. In the beginning I bought Stickley furniture, of which I still have a half a dozen pieces. I was collecting Fulper pottery, Rookwood, and Marblehead. During that first year I bought Bruce Johnson’s Price Guide to Arts and Crafts and read it cover to cover three times. And I decided I really liked the metalwork the most. As a New Yorker, I can’t have big giant things in my house and Roycroft is small, so it’s easy to own and it fit my personality. Collectors Weekly: Can you tell us the Roycroft story? Kornacki: The story begins with the Roycroft community and a guy named Elbert Hubbard. You really can’t understand Roycroft metalwork without understanding Hubbard, and he’s a character that should not be forgotten. He was a charismatic individual, a little bit of a philosopher, and a renaissance man and he made a fortune with the soap business in sales and marketing at a very young age. In the early 1890s he decided he wanted to give up conventional business. He went to Harvard for a year or two but then dropped out and traveled to Europe and was excited by the ideas of the Arts and Crafts movement that were brewing at that time. He got the idea that he would go into the printing business so he bought a printing press, made up the name Roycroft, and started printing little handmade books. The venture was very successful. He was combining advertising and marketing that he had done in the soap business with his philosophy, and was making little motivational pamphlets. Then he started publishing for magazines using his own press. It grew and grew. 1920 to 1926 was the heyday of the Roycroft Copper Shop. Hubbard then bought a bunch of property in East Aurora, New York and established an Arts and Crafts community called The Roycroft. Between 1896 and 1910 he established a bindery, print shop, powerhouse, chapel, blacksmith shop, a whole variety of buildings that looked like a little college campus. The idea was that talented individuals would come to the Roycroft community from all over and learn skills and make things and sell them. It was a self-sustaining, individual craft community. But behind all this was this man who was really a capitalist, and could really turn a profit. When he saw a business opportunity he went for it. He eventually ended up in the printing business, the furniture business, the metalwork business, the leatherwork business and he was an innkeeper, and also wrote extensively. The blacksmith shop existed to provide metalwork to the buildings that were being built. Sometime around 1908 or 1909 it essentially became the copper shop, because a couple individuals had begun doing copper work. Dard Hunter was a very talented designer who’d been working in the print shop doing book design for Hubbard, and took up copperwork at Roycroft and later on became an expert on papermaking. Then there was Karl Kipp, a trained metalsmith who arrived at the Roycroft around 1908. There were other individuals too. E.A. Fuchs who was a talented metalsmith, and Walter Jennings who was trained as a silversmith. By 1909 there was a group of very talented individuals working in the copper shop. That was a really special time period. Dard Hunter had already traveled to Europe and been exposed to all the new avant garde design work that was happening in Austria and England. We call it the Vienna Secessionist Movement, it’s really the beginnings of Modernism in the 20th Century when over-ornamented Victorian design was being left behind. European design around 1910 was really about stripping all that down and making newer, cleaner forms for a new century. Dard Hunter was around when that was all happening and he brought those ideas back to the Roycroft. From 1909 to 1911, Karl Kipp applied the new ideas introduced by Hunter and created some of the first modern decorative arts designs in the U.S. This sudden flowering of creative energy in East Aurora resulted in avant garde modern craft items in the Roycroft Copper Shop which were successful enough to keep the shop expanding through the teens and into the 20s and then all the way up until the Depression. The designs changed over time and the quantity of work did as well. There was a limited number of pieces made from 1909 to 1911, so Roycroft from that time is very desirable. As time went by, they experimented with different designs and finishes. Between 1920 and 1926 was the heyday of the Roycroft Copper Shop, and they were producing large quantities, a full line of everything including vases, bowls, leaded glass lamps, copper shade lamps, candle sticks, cigar boxes, and ash trays. They were selling it all through major department stores like Lord and Taylor, and almost every major department store in the U.S. Although there were several hundred people in the Roycroft community, there were never more than about 30 in the Copper Shop. It still exists and you can visit it. The Roycroft community was in full swing around 1920. In addition to copper, The Print Shop was going full bore, doing everything from handmade books to pamphlets to fine volumes by Lewis Kinder, the best binder in America at the time. They produced fancy gold inlays, tooled leather, some of the finest hand bound, “fine press” books ever made were done at Roycroft. The Copper Shop was just one spot on the campus. They had a furniture shop, and Roycroft furniture is very desirable today. They were making leatherwork at the leather shop. They made purses, wallets, belts, and the designs on the book covers. They had quite a craft community going. Collectors Weekly: Tell us about people who collect Roycroft. Kornacki: There are Roycroft collectors who collect very broadly including, books, ephemera, postcards, furniture, metalwork, leatherwork, anything to do with Roycroft. There are also people who collect with discipline, like specific books or metalwork. Collectors who collect Roycroft metalwork will very often collect a broad range of metalwork from the entire Arts and Crafts movement. The first piece of Roycroft copper metalwork was actually made at the blacksmith shop and showed up in the 1906 Roycroft furniture catalog. It was a letter opener and a pen tray. The Copper Shop didn’t go into production until 1909 and stopped around the mid 1930s, because the Depression hit and hammered copper had fallen out of favor. By the late 20s, the hammered metalwork from 1912 was starting to look dated. Modernism started to come in, and the Bauhaus movement in Germany was pretty well known. By the 1930s the Deco movement was in full swing and most Roycroft does not look Deco. Roycroft did their best, tried to experiment with new designs, even a few very strong Art Deco designs later on. But to Roycroft collectors those pieces aren’t desirable at all, and so they are relatively cheap today. People collecting Roycroft copper today generally want brown metalwork with hammer marks on it, they don’t want smooth surfaces with bright shiny angles. 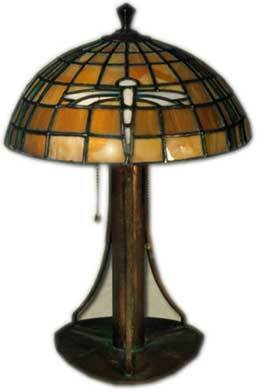 The most desirable Roycroft pieces are from 1909 to 1915. They were heavily influenced by European Designs, specifically the Vienna Seccession Movement, and are very geometric. We call those “silver square” pieces. They’re geometrically shaped with square cutouts, German silver overlays, and architectural forms. They don’t look like most of what was being sold in America at the time. The European designers were a little ahead of the game. These items are few and far between, and highly prized by Roycroft collectors. They were made by a few people in the Copper Shop doing original handmade work from start to finish. It was true artistic expression, and the designs were very avant garde. There’s another collecting niche at the high end of Roycroft which is the work of Karl Kipp. He left Roycroft in 1911 and set up his own shop across the street called the Tookay Shop. He brought with him Walter Jennings who was the best chaser, the best at carving designs into copper. The Tookay Shop lasted from 1912 to 1915, and many Roycroft collectors collect that work as if it was Roycroft. The pieces are sometimes almost identical except for the mark. Many of the pieces made at the Tookay Shop were made by Walter Jennings, which is the third area of specialty collecting. Some collectors say the best Roycroft metalwork is that of Walter Jennings. He worked in a very specific style featuring decorated surfaces. If you look at the Germanic stuff, there’s little or no decoration on any of it. It has cutouts and may have some silver appliqué, but there’s no carving on it. But with the Jennings work, which was after the Secessionist era, the work is spectacular, especially the cylinder vases. 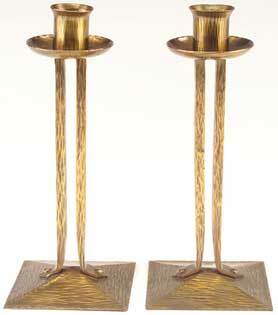 Roycroft pieces are from 1909 to 1915 were heavily influenced by the Vienna Seccession Movement. Roycroft made many cylinder vases. Karl Kipp and Walter Jennings working together developed a style and just seemed to love that form. Roycroft had it in production until the later 1920s as a catalog piece, but Jennings did a handful of cylinder vases on his own that were very unique and the workmanship was above and beyond the work done at Roycroft. So the holy grails are the Vienna Seccessionist silver square stuff done from 1910 to 1912, plus anything coming out of Karl Kipp’s shop, or anything done by Walter Jennings, especially the decorated cylinder vases. I think one of the challenges we face now is that many of the Roycroft craftsmen are still mostly unknown. Karl Kipp is recognized because he had his own shop and issued two catalogs and advertised in various magazines. And Jennings is known because he made a lot of metalwork, lived a long time in East Aurora, gave a lot of stuff away, and also signed the things he made at home with one of his marks. And another designer, Victor Toothaker, had a lot to do with Roycroft metalwork design after 1912 and is known because he also worked for Gustav Stickley. Toothaker supposedly designed the Roycroft American Beauty vase, along with many of the lamps, boxes, and candlesticks. You can argue that the Roycroft Copper Shop wasn’t a truly viable commercial venture until Victor Toothaker showed up in 1912. There are several other names we don’t know much about. E.A. Fuchs may have contributed way more to the Roycroft aesthetic than anyone realizes, for example, the five arm candelabra, one of the finest Roycroft pieces to ever emerge, wasn’t signed Roycroft, but E.A.F. And one of the iconic Roycroft forms is the Princess candlestick, which most collectors think was designed by Karl Kipp, but there’s a drawing of it out there that’s signed at the bottom E.A.F. So Fuchs may have had a lot to do with Roycroft’s success that we just don’t know about yet. Others included George Wilson, Art Cole and Henry Unverdorf, who was the spinner and worked the lathe. But we just don’t know enough about these unsung heroes yet. Collectors Weekly: How do you date Roycroft copper? Kornacki: Almost all Roycroft is marked, which makes it easy. There are different variations of the marks, early, middle, and late, and then some other variations. And each one had a couple of different sizes and shapes. I’ve spent a lot of time examining the marks. The early mark is from the beginning of the Copper Shop in 1909 until around 1920. 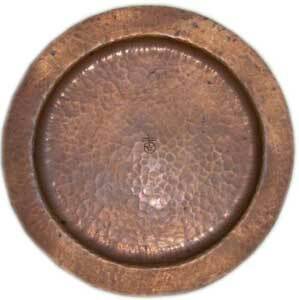 The middle mark was used from 1920 until the end of the Copper Shop into the 1930s. And the late mark came into the existence in the late 20s and was also used to the end. A piece might have an early mark from 1919, but that’s not what I would consider early Roycroft. Early Roycroft is really before 1915. Dating with marks is a little tricky. All Roycroft can be dated by the make and the form, but you have to be careful. No piece has a date on it, just the little R with a circle and a cross with two slashes. The shape of that mark changed over time. The vast majority of Roycroft that shows up is made in the 1920s and after. Which doesn’t make it bad, it’s just when they made a lot of stuff. The most common pieces are small candleholders, desk items, letter openers, ashtrays, small bowls and vases, a lot of bookends and blotter corners. Most of that stuff was made in the 1920s. The pieces that show up less often are larger bowls, large vases, and lamps. Those were also made in the 1920s but they were more expensive so they didn’t sell as many of them. The Vienna Seccessionist pieces I was talking about, these are the pieces that you can metaphorically count on one hand. There are probably less than 10 known boxes with silver appliqué. The trapezoidal vases there’s maybe a couple dozen tops, the big five arm candelabra there’s only one, the triple arm candelabra there’s only two, so that stuff’s in a completely different league. 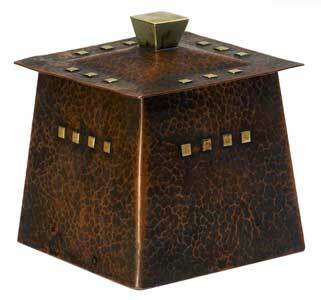 In 1912 when Victor Toothaker showed up, the range of metalwork expanded a great deal and they started making a full line of lamps, all kinds of boxes, large vases, and a whole range of little vases with classical, middle eastern, colonial, and medieval designs. So many influences came in, but the wonderful thing about Roycroft is that when you see a piece, you always know it’s a piece of Roycroft. There is a Roycroftness to the form and the color and the piece in general. There is an integrity to the pieces from the 1910 pieces all the way through to the end in the 1930s. The finishes changed; in the early days everything was a very rudimentary brown finish. In the teens they introduced a brass finish, and then they introduced a more refined brown finish that they call Aurora brown. Then there’s later Aurora brown, which has a lacquer finish. There’s a Verde green and a Etruscan green, an acid etched finish, and a silver finish, both silver plate and silver wash. There are over a dozen Roycroft finishes that are distinctly different from each other. Although the vast majority of Roycroft is brown or brass. All the early pieces are handmade, but as time went on the production changed and they started using machines more. An early vase would be hammered out over an anvil or stake, later on they would use a machine called a lathe to spin the vase, we refer to it as spun metalwork. 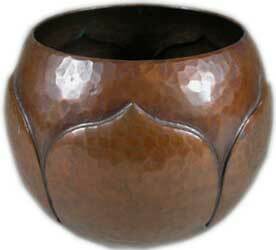 They put a form usually made out of wood on a lathe and they spun the smooth copper over it and formed a vase. Then they would take a hammer to it to give it the handmade finish. The degree of handiwork decreased over time. But The Karl Kipp and the Walter Jennings work is mostly handmade. My favorite items are my Walter Jennings vases. They’re unique; each one is one of a kind. I’ve been fortunate enough to acquire six of them and they’re just wonderful. They are the definition of decorative art; each one is a work of art. Collectors Weekly: When did people start collecting Roycroft? Kornacki: It started in the 70s but really took off in the 80s. In many ways Roycroft collecting evolved with interest in collecting Arts and Crafts more generally. I recently read a fascinating book by Todd Volpe called Framed that describes the early days of Arts and Crafts collecting. He was one of the firstArts and Crafts dealers in New York City and was instrumental in creating the market for Arts and Crafts by selling to famous stars. His gallery and other dealers like David Rago and Beth Cathers took something that few people were really interested in and created a market for it. This included Stickley furniture, art pottery like Fulper and Grueby and of course Roycroft. I think what makes collecting Roycroft popular now is that in addition to their intrinsic attractiveness, in many ways it’s the perfect collectible — you can collect it at multiple levels. At an entry level it’s available enough so that when you have the urge to buy you can usually find something to buy. But as your sophistication level grows, your taste level and willingness to spend money increases, there are pieces that come up at all price levels. It shows up at auctions, online, antique shows, it’s just available enough to keep you interested but it’s not too available that it’s really common. You can go to 20 antique shops and not see a single piece, but then go to the next one and find a gem. Collectors Weekly: What advice do you have for potential Roycroft collectors? Kornacki: Get all the catalogs you can. Many of the catalogs have been reprinted, you can even buy them at Barnes and Noble and Amazon. The trick is to become very familiar with the forms. There’s some fake Roycroft floating around these days that’s Mexican metalwork stamped with fake Roycroft stamps. It’s not that difficult to realize a fake because it’s always going to be a form that Roycroft didn’t make and 99% of what they made is in the catalogs. Handle the pieces so you can get a feel for what Roycroft looks like and feels like. When most collectors start buying, they start buying what they see available. On eBay there are a lot of bookends and nondescript low bowls, trays, and odd desk items. So new collectors end up with all of this random stuff, but that’s not what you want to be doing. You want to be focusing on pieces that display well and represent the best of what Roycroft was doing. I generally tell people to try and put together a collection of classics. Like an American Beauty vase of any size (they came in 4 sizes). 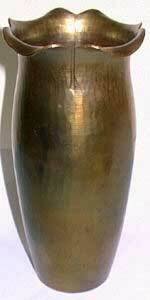 Another classic Roycroft item is the “bullet vase” with a silver overlay. It’s a bit of a Deco design introduced around 1916, but a wonderful design that combines some of the Secessionist elements that they were doing early on with great workmanship. Every collector should also have a cylinder vase, which came in 7 inch and 10-inch sizes. It’s a great example of tooled decoration on Roycroft. A lamp is always a nice thing, the helmet lamps show up a few times a year and there are a couple different variations. Princess candlesticks should also be on your list, they were made for a long period of time, and the best ones being made at Karl Kipp’s shop. It’s better to have one really wonderful piece like those than nine pairs of bookends. From there, you can push your collection any way you want. I tend to collect vases that run from 1910 to the 1920s and I’ll always go for the one in the best condition because that’s a keeper. Roycroft original finishes cannot be replaced and still look original. Collectors Weekly: What are some good resources for collectors? Kornacki: The number one book is called Head, Heart, and Hand. It’s the only true, worthwhile, comprehensive book about Roycroft work; and it has a wonderful chapter on metalwork. The Kevin McConnell Price Guides are very good reference material. The original catalog reprints are essential, and there are many of them on the market. The Karl Kipp catalogs are definitely essential to have, both the 1912 and the 1914. Bruce Johnson’s Arts and Crafts Price Guide is a wonderful introduction to Arts and Crafts metalwork in general as well as Karl Kipp and the Roycroft shop. David Rago’s auction catalogs are important too, they’re online, and most of his auction catalogs from the last 10 years are there. Every one of his auctions has a lot of Roycroft in it so it’s great to see how much things are selling for, how much they used to sell for, and how many of each object is selling. There are only a few main places to buy Roycroft, one is eBay, two is David Rago’s auction, three is the Treadway auction in Chicago, and finally the Skinner auction in Boston. Antique shows, flea markets, and shops sometimes also have Roycroft items, but I’d start with the four I mentioned. There is also a Roycroft group on Yahoo called The Roycroft Group. It’s an email group and we’re always welcoming new members. Hi: I have a copper plant stand that looks very much like a Roycroft to me but is not marked. Were all Roycroft items marked? This looks to be a very early piece. Always enjoy reading about something well written and interesting. Best way to get a nice finish back on a piece of Roycroft is to send it to Chris Banich in Atlanta. His “early” Roycroft brown is amazing. I HAVE A 2 CANDLESTICK HOLDER THAT IS CURVED, STAMPED WITH THE ROYCROFT SEAL AND ALSO SIGNED WITH A B652 SCROLLED. I CANNOT FIND A SIMILAR CANDLE HOLDER IN ROYCROFT ITEMS. IT WAS GIFT FROM A DAUGHTER OF A FORMER SILVERSMITH WHO WORKED AT THE ROYCROFT COPPER PLANT. I RECEIVED IT IN THE EARLY 1970’s. ANY INFORMATION ON THIS ITEM ? ?